An interesting development this season is the awards season trajectory of The Town, the Ben Affleck-helmed, Ben Affleck-written, Boston bank heist thriller starring Affleck and last year’s Best Actor nominee Jeremy Renner (plus Rebecca Hall, Jon Hamm, and Chris Cooper). After Affleck’s crew robs a bank managed by Hall, he approaches her to make sure she didn’t see any indentifying features to tell the police. Naturally they fall for each other, just as he is planning one last big score. The film bowed at number 1 in mid-September with $33 million and surprisingly rapturous critical approval. As of now it’s nearly hit $92 million. The box office success and critical acclaim has thrust it into the awards race. Oscar bloggers are predicting it for Best Picture. Warner Bros. rushed it to DVD yesterday, just three months after its release, to time it for an awards push. Every other day there’s an item about someone loving the film, like Robert Duvall. On the other hand, in the early awards it’s only picked up Supporting Actor nods for Renner from the Golden Globes and SAG with little acknowledgment from critics groups. But what’s the real deal, the straight talk you can only get from the Grouches? We’re here to tell you. And we think it’s hogwash. I find the Oscar buzz for The Town puzzling. Though, to be fair, I find the slobbering critical response puzzling as well. It’s a good movie. It’s entertaining and taut. But what people see as special elements transcending its genre just don’t work for me. Mainly it’s the relationship between Ben Affleck and Rebecca Hall that trips me up. They don’t have any chemistry and I don’t see any reason they should be together. I suppose I can understand why she would cause him to soul search. She represents a new, positive force in his life and a way out of the criminal world that he’s been considering. But I don’t know why she sticks around with him. And because it’s not a believable relationship it doesn’t give the film the emotional depth it intends. Which just makes it a good heist film. It’s not that it isn’t a typical Oscar film. It’s that it’s not a great film. As for the Oscar buzz, I suspect people are looking for any box office hit to throw into the race after the way The Blind Side made bank on its way to a Best Picture nod last year. And I think that’s not a bad way to look at it because voters are probably doing the same thing. I just can’t help but think it’s more about timing than quality. If it was released in the summer, I doubt we’d be talking about it now. It’s rather unfortunate (for blog purposes) that Brian, John and I all fundamentally agree about The Town, at least in the sense that we don’t really get why it is an Oscar contender. Frankly, I don’t even think the film is particularly good genre fare, much less a good movie. The heists don’t feel fresh and really aren’t all that interesting. The film isn’t twisty. 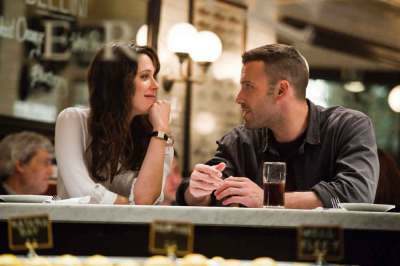 John points to the poorly developed relationship between Ben Affleck and Rebecca Hall. I’d submit that none of the relationships between the primary characters are developed. Mostly because none of the characters are. Jeremy Renner is the stock angry young man. There’s not really any point for Jon Hamm or Blake Lively to be in the movie. I’m a Rebecca Hall fan, but I don’t think she’s given anything to work with here. And Ben Affleck, I mean, I get that he’s the brains of the operation trying to make good. But didn’t we figure that out in the first two or three scenes? I agree with John that because The Blind Side received a nomination in the Academy’s return to ten Best Picture slots, that people are figuring on one spot being taken by a more populist movie. I still think that despite the good box office and favorable reviews, it has a tough road to a nomination. Thanks to all the actors named above, plus brief appearances from the likes of Chris Cooper and Pete Postlewaite, it did seem likely to pick up some steam with the SAG awards, but I don’t see too many other groups singling it out as a best movie. The Blind Side was kept in the conversation thanks to the story of Sandra Bullock’s march to victory, I’m not sure The Town has any similar sort of buoyancy. Besides, if you are looking for a well-received movie that broke $100 million at the box office, would Shutter Island make more sense? Ben Affleck and Jeremy Renner are well-regarded, but Martin Scorsese and Leonardo DiCaprio are a little bit more so, I’d imagine.